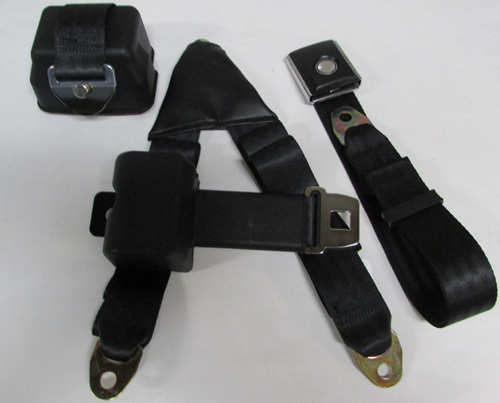 Seat belt extenders that snap in to an existing seat belt buckle or that bolt to the existing seat belts anchor end fittng and to the floor to extend the overall length of a seat belt by 6", 9" or 12". All of the seat belt extenders are manufactured certified to meet FMVSS (U.S. Federal Motor Vehicle Safety Standards) 209 and 302 requirements and are manufactured or assembled in the USA. These seat belts extenders are not implied to be vehicle or application specific. Due to the many variations of seat belt buckles and latch ends we make no guarantee that the snap in extender latch will fit in to an existing seat belt buckle or the snap in extender buckle will snap on to an existing seat belt latch. Installation instructions and the required attachment hardware is included. Kit also includes a black paint to match bolt head cover. Available 6", 9" or 12" long. Contact us for the availability of colors not listed. Not guaranteed to fit in to existing buckle or latch end. Latch end inserts into existing buckle. Existing latch inserts in to buckle to extend length by 12". Available with black webbing only.